Saga Cruises, the UK based company that sells only to customers only aged 50 or more, has changed its plans regarding the18,891 gross ton Astoria it acquired with an intention to operate it as Quest for Adventure on fly cruise basis under the Spirit of Adventure brand. The ship will now be renamed Saga Pearl II and operate under the Saga Cruises brand as a replacement of the 24,300 gross ton Saga Rose that will be retired next year. Saga has published itineraries for two Mediterranean cruises from Southampton and a Christmas cruise to the Caribbean from the same port. The first Mediterranean cruise will depart on 30 October. 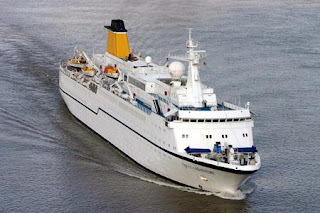 Saga said on 14 July that the ship will undergo a multi-million pound refit before its inaugural cruise as Quest for Adventure gets underway on 1 July 2009 from Harwich around the Baltic.